Manchester City manager Manuel Pellegrini said Chelsea played like a "small team" during Sunday's 1-1 draw and criticised their defensive style. Andre Schurrle put Chelsea ahead before Frank Lampard levelled for 10-man City. Pellegrini, 61, said: "I think we played 90 minutes against a small team trying to defend. "I would not be happy to play that way. Ten players defended their own half, they scored a counter attack and they continued to defend until the end." Pellegrini likened Chelsea's style to that of Stoke's, who beat the Premier League champions 1-0 at the Etihad in August. "I think we played against exactly the same team we played against Stoke here," he added. "It was very difficult for us to score but finally we did. The result is not what both teams did during 90 minutes. "I don't want to analyse Chelsea. What the other teams do, it is not my duty to analyse." City battled back into contention following the second-half sending off of Pablo Zabaleta after the Argentina defender was involved in a tussle with Chelsea's in-form striker Diego Costa. "I am happy because our team played in one way, we continued playing with 11 players, trying to score, and with one player less trying not to have another counter attack and concede a goal," said Pellegrini. "We continue with the same ambition, teams will find it hard to beat us. The team performance was very good." Responding to Pellegrini's criticisms, Chelsea manager Jose Mourinho said: "Many times he says he doesn't speak about me or my team but he continues to do so. Don't ask me about these words." It was left to former Stamford Bridge midfielder Lampard, on loan at City from New York City FC until January, to secure the point which ensures City remain five adrift of league leaders Chelsea. Pellegrini said he knew the former England international, who scored 211 goals in 648 appearances for the London club, would have an impact against his long-time team-mates. "I was sure that if Frank Lampard plays he will score, things like that happen in football," he said. "He will be a very important player for us. From the beginning he has been involved 100% in every day. "I think that maybe he was not happy to score against such an important team for him, but he is very professional." The latest great managerial rivalry? 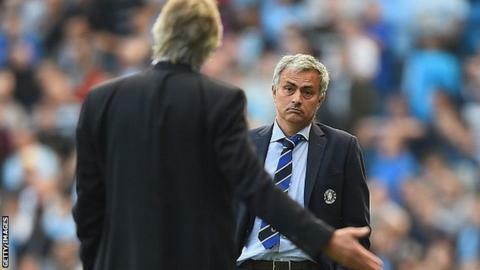 Read more on Jose Mourinho & Manuel Pellegrini: The latest great rivalry?